As we learn in our open water class that holding your breath underwater can cause one of the three general types of lung overexpansion injuries: air embolism, pneumothorax, and tissue emphysema. If you are not trained in staged decompression you must avoid staying down longer than your dive tables allow. Staying within the limits is the first step in preventing (DCS) Decompression Sickness. The second step to preventing (DCS) is to always ascend at a (NAUI) rate of no faster than 9 meters (30 feet) per minute. This gives your body a chance to off gas some slight amount of nitrogen as you ascend and to avoid the rapid pressure change that could cause bubble formation. Understand your personal limitations as well as the limitations of your training and strive to stay within them. Seek professional training and assistance to learn new diving techniques, use unfamiliar equipment or when planning to dive in unfamiliar locations or conditions. will help in being a responsible diver as well as preventing injuries. B - BCD make sure that everything is connected. Make sure the dump valves are working, the BC holds air and the tank is securely fastened. W - Weights: make sure the weight belts are on or are secure in their pockets if you have an air integrated BC. Also check that weight belts are set for right hand releases. A - Air: double check your air (and your buddys) is on. Check how much pressure is in the tank. Check the air to both the primary regulator and octopus. R- Releases: check the releases where they are, how they come undone and are they properly buckled before the dive. You need to be aware of how it works for your buddy in case of an emergency. 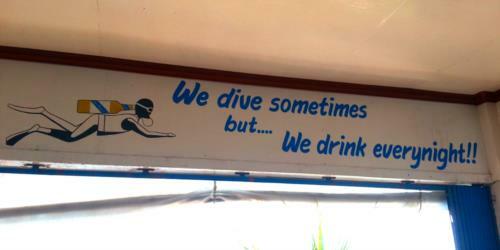 The SCUBA Beer fine rules!